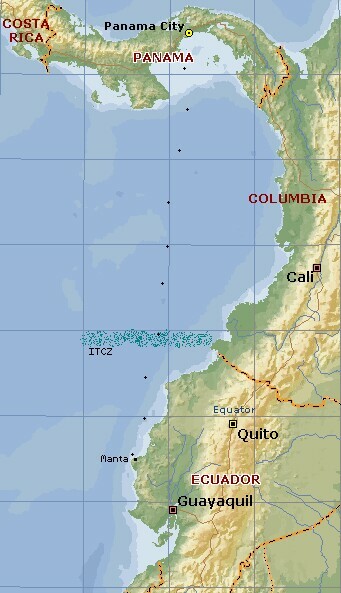 Our passage from the Balboa Yacht Club, Panama, to Manta, Ecuador, was one of our easiest passages. Besides taking only 4 days, it was also our first with our new "crewmember", Otto Von Helm (the autopilot, repaired and upgraded in Panama). Otto worked flawlessly, enabling us to go from a 2 person watch system to only needing a single person on watch at night. Map scale is 2 degrees per division (120 miles or about 200km). The Equator is just above Quito. You can also read about our individual impressions of our Ecuador Passage on our Destinations page, but, of course, these newsletters reflect what was happening right at the moment. And now we've even got photos included.